Row by Row 2016 Begins June 21st! 2016 Row By Row Experience - Home Sweet Home! Nothing says home like your local quilt shop, and we thought our shop would be well represented by Charlotte's beautiful motorcycle trike. We even put our shop license plate pin on the back of the trike! The fun kicks off on Tues., June 21, with our shop pattern available at no cost until Sept. 6, one pattern per customer. We're madly making kits, too! This year each kit includes a cute Quilt Patch Lapel pin to put on the back of the trike! We have the official Row by Row-Home Sweet Home fabrics and a variety of fun Row-related patterns. 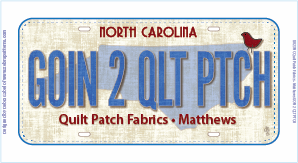 Collect our 2016 fabric license plate! Join us tomorrow for our Saturday Night Sew from 3:30 to 8:30. Come earlier to shop-remember it's Barefoot Weekend! Bring a project to work on and enjoy the company of quilter's. We'll order out for dinner around 5:30, or you can bring something with you. Please call us to reserve your spot 704-821-7554. The beautiful twists and turns in this quilt are a result of simple strip piecing and careful placement. it has an entirely different look!